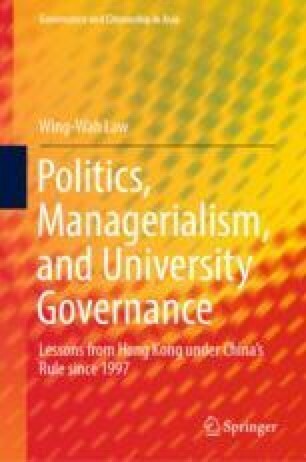 This chapter examines the basic relationship between the state and public universities and their governance, and how market and managerial values and practices can be used to regulate university autonomy in Hong Kong. It shows that the institutional autonomy of Hong Kong’s public universities has been reduced since the 1990s. The University Grants Committee (UGC), mediating between the government and public universities, has made use of the international trends of coupling market principles and managerialism to reform university governance and rationalize its increased control over the institutions it funds. The UGC has become a principal actor in shaping the direction of public universities’ institutional development, reviewing and auditing institutional performance in major activities, and downsizing and empowering university councils to ensure fiscal transparency and accountability. As a result, the UGC has established a regulatory regime for higher education, in which public universities are subject to more UGC control, both external, through regular reviews and audits of various domains of university affairs and activities, and internal, through empowering university councils (or governing boards) and increasing the number of external members. Quacquarelli Symonds. (2017). QS world university rankings 2016–2017. Retrieved from https://www.topuniversities.com/university-rankings/world-university-rankings/2016. Secretary for Education. (2012, December 5). LCQ18: Non-local students enrolled in UGC-funded institutions. Retrieved from http://www.info.gov.hk/gia/general/201212/05/P201212050310.htm. Times Higher Education. (2017). World university rankings 2016–2017. Retrieved from https://www.timeshighereducation.com/world-university-rankings/2017/world-ranking.